We are recruiting a new Communications and Fundraising Manager to join our team. Could you be who we are looking for? Are you passionate about the Bible and Bible Mission? 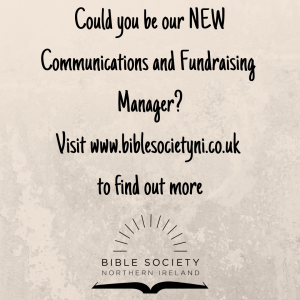 Could you take responsibility for the communication and message of the Bible Society in Northern Ireland? Could you develop our fundraising strategy and help us reach and extend our audience of supporters? To find out more, take a look at the Information Pack for the role by clicking here. You can download an Application Form here. 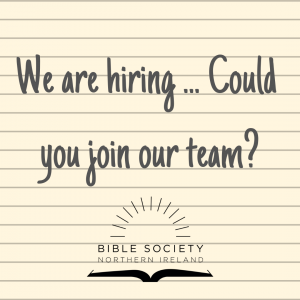 Please return your completed application form by email to catherine@biblesocietyni.co.uk or by post marked Private and Confidential to Catherine Little, Bible Society NI, 27 Howard Street, Belfast, BT1 6NB before 12noon on the 29th April 2019.